I had a bunch of very ripe bananas hanging in the fruit basket and knew it was time to either use them or freeze them for smoothies. 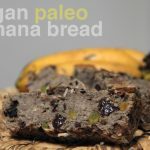 Inspired by my crossfit friends I decided to take the challenge and create paleo friendly banana bread. The mission was to come up with a banana bread using no added sugar, no eggs (to still keep it vegan friendly) and no grains. Of course, it still had to be as delicious as traditional banana bread. 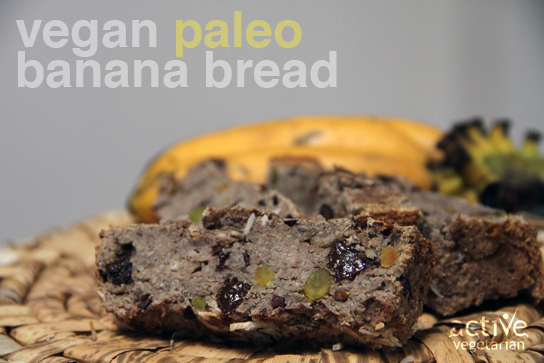 I am excited to present to you with our version of Vegan Paleo Banana Bread! This grain free banana bread with pistachios and raisins is moist and delicious and packed with protein! Line a loaf pan with parchment paper or grease well with coconut oil and set aside. In a small bowl mix flours, cinnamon, baking soda, and salt. Add pistachios or walnuts and raisins and stir until well coated and set aside. Add that to the dry ingredients and mix with a spatula until well combined, no more. Pour the batter into the prepared loaf pan and sprinkle with coconut or chopped pistachio. Place in the oven and bake 70-75 minutes, until the center is set (a toothpick inserted in the middle of the loaf should come out clean). Set loaf on a wire rack and let it cool in the pan for about 5 minutes. Finish cooling on the rack and transfer to the refrigerator, where it will keep for up to a week in an airtight container.